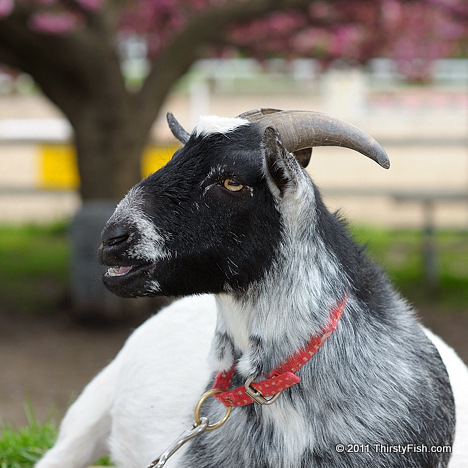 This cool pet goat was roaming freely, trying to find a comfortable spot, at the Chamounix Equestrian Center, which is located in Fairmount Park, Philadelphia. The Pet Goat has somewhat become an expression with a political tone. On September 11, 2001, the United States President, George W. Bush was recorded reading the children's story "The Pet Goat" to elementary school students when he was informed of the attacks on the World Trade Center. He was criticized for being indecisive for continuing to listen to the story and not immediately reacting. I guess that's how politics goes. If you abruptly stop what you are doing and react, you will be accused of panicking. If you finish what you are doing, then you will be accused of indecisiveness. Carefully crafting a personal image is not limited to politicians and movie stars. How we desire to be perceived has increasingly become more important than what we actually know, how we feel, or how we think. When we interact with people, more often than not, we are interacting with their idealized or manipulated image, and they, with ours. This is not limited to our formal relationships and extents to our closest friends, family members and spouses. How we present ourselves rarely has anything to do with who we are. When we do spend some honest time with people, we observe their true personalities seep through the cracks of their sculptured images. The moral become the immoral. The secure become the insecure. The smart become the stupid. The cool-headed become the bitter. The tough become the fearful. The caring become the selfish. Why are we obsessed with manipulating our personal image when it is easier just to be ourselves and enjoy a lifelong process of learning? The answer to this question is not simple, but it is a relief to know that there has always been a few seekers among us, for whom the truth is more important than the image. Unfortunately: "Those who know do not speak. Those who speak do not know" - Tao Te Ching.